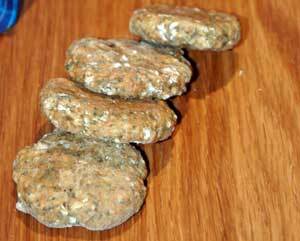 Mutts de la Mer are tasty, fishy patties made with tuna, salmon and quinoa. Packed full of goodness, these treats promote healthy skin and coat. Quinoa is a complete protein, containing all 8 essential amino acids. It has been growing in South America for 6000 years, and is rich in protein, minerals, Omega oils and it's gluten free. Its composition makes it easy for dogs to digest. 1. Mix all the ingredients in a large bowl until combined. Drop teaspoon of mixture on to a baking sheet lined with greaseproof paper. 2. Place in a pre-heated oven, 200°C/400°F/Gas Mark 6 for 15-20 minutes. Remove from the oven and transfer to a wire rack to cool. Place 8-10 patties into small seal-able freezer bags and freeze until required. Hey guys, I totally recommend you try this recipe. I did and my dog was certainly glad I did. She sat in the kitchen and watched me make them, (nothing unusual in that as she's always hanging around me) and didn't move until I took them out of the oven. I think the smell of them cooking had her almost hypnotized! She couldn't wait for them to cool down so I cooled one for her (I know, I'm a big softie) and she just lapped it up. I now make this recipe for her at least once every 2 or 3 weeks and only give them to her as treats when she's been good. I finally got around to trying your Fish Patties - yes, well, better late than never! I just wanted you to know I thought they were so easy to make (and quick) and Max loved them. I'll definitely be making these again, and very soon. My Cocker Went Mad For These! I tried this recipe recently and my Cocker went mad for them. He's normally quite greedy but this was different - he whinned so much that I had to put them in a tin and then put the tin in the cupboard - well out of sniffing reach! These treats are great - my cocker spaniel just loves them and will do anything I ask, just so long as he gets one of your fishy treats! These fishy bites sound like they're going to be really tasty - I can't wait to try your recipe Hannah! Max loves salmon, so I think he'll really enjoy them and, as he's such a good dog, I think he deserves a few treats. In the meanwhile, if anyone else tries them, why not let us know what you think?